UK HEROINE REMEMBERS US HERO!!!!! 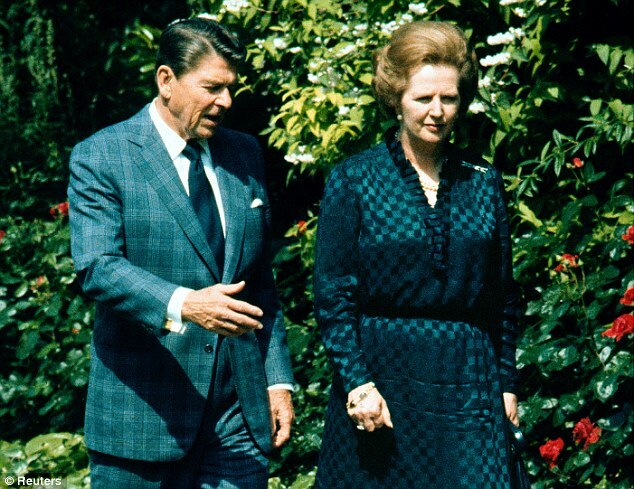 BARONESS MARGARET THATCHER, WHO REFUSED TO BE BLACKMAILED BY GURU MAGGOT TERRORIST SCUM AS BRITAIN’S SECOND GREATEST LEADER AFTER OLIVER CROMWELL, WILL CELEBRATE THIS YEAR’S FOURTH OF JULY IN REMEMBRANCE OF RONALD REAGAN, AMERICA’S SECOND GREATEST PRESIDENT AFTER GEORGE W. BUSH!!!!!! He was the former actor loved and loathed for fighting the unions and championing ‘Reaganomics’. . But all eyes in London on Monday are more likely to be on former British prime minister Margaret Thatcher than Ronald Reagan’s new $800,000 (£500,000) statue. The frail Iron Lady, who rarely appears in public, is ‘determined’ to attend the unveiling with around 2,000 people on Independence Day. Baroness Thatcher, 85, declined an invitation to April’s Royal Wedding and could not attend her 85th birthday party last October because she had flu. But her crucial partnership with Mr Reagan, who died in 2004, is seen by many as the reason for the fall of the Berlin Wall and Soviet Union. WHAT A GREAT WAY TO KICK OFF THIS YEAR’S FESTIVAL OF FREEDOM!!!!! Comments Off on UK HEROINE REMEMBERS US HERO!!!! !